The event poster says, “Bermuda can and should be proud of its long history of sea turtle conservation, research and outreach. 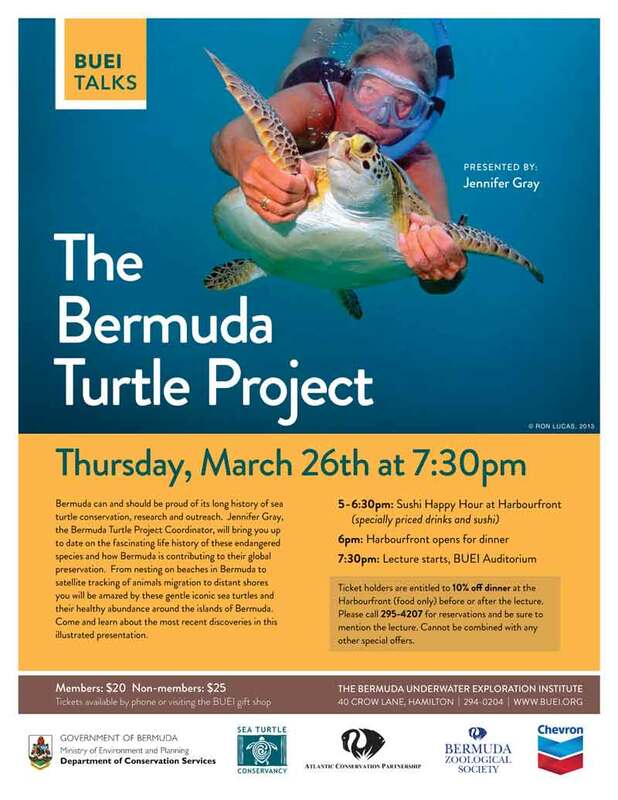 Jennifer Gray, the Bermuda Turtle Project Coordinator, will bring you up to date on the fascinating history of these endangered species and how Bermuda is contributing to their global preservation. A sushi happy hour will be held at Harbourfront from 5.00pm through 6.30pm, with the Harbourfront opening for dinner at 6.00pm and the lecture itself beginning at 7.30pm in the BUEI auditorium. The entry fee is $20 for members and $25 for non-members. Tickets are available by phone at 294-0204 or by visiting the BUEI gift shop.